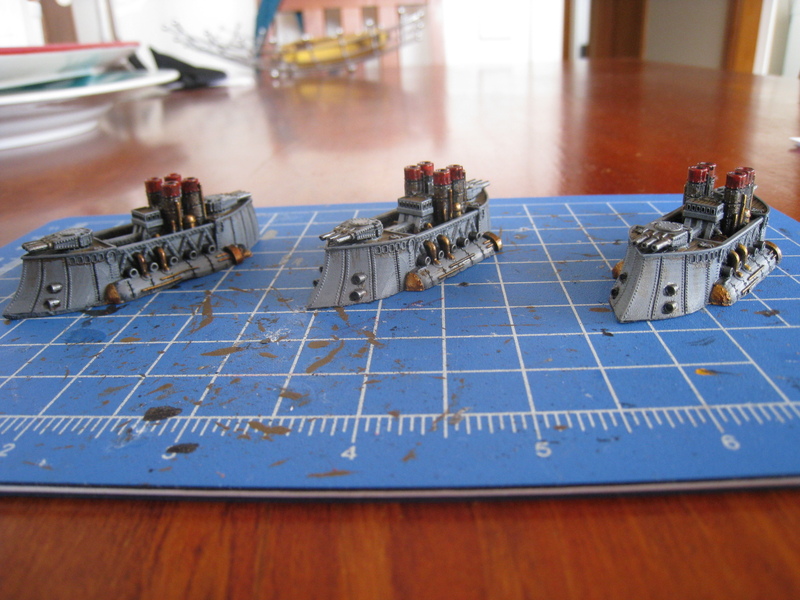 Continuing with the Dystopian Wars theme, here are my three Cruisers, HMS Colossus, HMS Warspite and HMS Vanguard. Not the greatest of pictures, but you get the idea. Hulls are a lovely shade of rusted Battleship Grey! More pics later on today hopefully, my camera just ran out of charge. In terms of the game, the Kingdom of Brittania cruisers are underwhelming. They have two main turrets which have the same firepower as battleships, torpedo ports and a broadside capability. However, they sink anytime anyone looks at them funny. To prevent that, they have the option of a shield generator, which comes in place of one of their primary turrets- but to my mind, losing a primary turret means they become altogether more useless. So these three all have both turrets, and damn the consequences! I am also looking forward to our proper Market Garden game next week (Oct 1st). My force will be representing the various ersatz Luftwaffe kampfgruppen, hastily thrown together in an attempt at blocking the allied advance around Nijmegen. So, it will be a challenge! I will be defending the centre of the table against both the 101st and the 82nd Airborne divisions, and holding out until the SS can counter-attack. All this with Reluctant Trained troops; assure the Furher that my old men and boys from the flak batteries will hold! No more Beep Beeps then. I checked out the Dystopian Wars book today.